The Hon’ble Prime Minister of India, Shree Narendra Modi launched the flagship project of the NDA Govt. called the Pradhan Mantri Awas Yojana in the year 2015, which aims to provide housing facility to every Indian. The whole project will be completed in three phases – Phase 1, Phase 2 and Phase 3. Under this housing scheme, the Govt. has promised that every citizen of the country will have roof over their heads and along with this, proper house for the families with all required necessities will be taken care of. The Govt. has promised to deliver this scheme by the end of 2022. As per the plan, the entire project will be administered by the Housing Ministry, Govt. of India. The span of the scheme is 7 (seven) years from its launching year in 2015 and the Modi Govt. has made a promise to complete the scheme by the end of the year 2022. This scheme has been planned to be completed in three phases. These three phases are being identified as per priorities. Those cities which need the most number of housing solutions will be targeted first. In the first two phases, 100 cities will be handled in every phase. The Phase 1 of the P M Awas Yojana has already being rolled out from its launch. This phase runs for two years i.e. from April 2015 and ends in March 2017. A total of 100 cities have been targeted to carry out this project. The cities with maximum priorities like the cities with most populations, housing requirements, urbanization ratio and other factors will play a very important role for implementation of the project in the Phase 1. 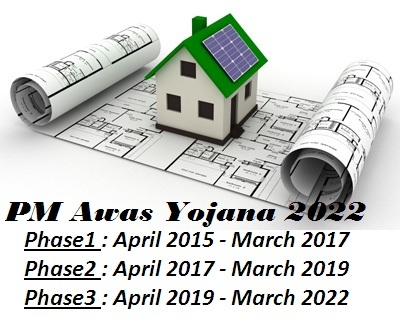 The Phase 2 of the P M Awas Yojana will start after the completion of Phase 1 i.e. from April 2017. The Phase 2 will also be done in two years and will be completed by March 2019. In this phase, nearly 200 cities will be covered and housing development works will be done there as per the Yojana. After a total of 300 cities were given housing developments in the first two phases, the rest cities will get the housing benefits from the Awas Yojana. This Phase 3, which is the final phase of the scheme will start from April, 2019 and will be executed till March 2022 or till the finish of the project. Necessary project implementations are being carried out by the Housing Ministry so as to ensure delivery of the complete scheme by 2022 and fulfil the promises. Beneficiaries under this scheme Women, Economic Backward families, Scheduled castes and tribes. When d project will start in mumbai,pune or Thane? I am UNMARRIED MALE of aged 29 years. I am going to purchase RESALE property (5-6years age). My own income is of 7lacks to 8lacks. Does I am eligible for PMAY? Does Woman name is compulsory for eligibility for PMAY?